PENINSULA, Ohio (July 14, 2010) – Century Cycles is teaming up with NiteRider Technical Lighting Systems to offer local bicyclists the chance to try the company’s innovative, high-powered lights on a Century Cycles Night Ride on the Towpath Trail on Saturday, August 7. The NiteRider bicycle light display and free demo begins at 6 p.m. in the parking lot of the Century Cycles bicycle store in Peninsula, Ohio (1621 Main Street, on Route 303 between Route 8 and I-271, next to the Winking Lizard Tavern). The free Night Ride starts in the same lot at 8 p.m.
NiteRider will have an assortment of its most popular bike lights available for bicyclists to demo on the two-hour Night Ride. Those interested in using a NiteRider demo light must provide a driver’s license and credit card as collateral, and all demo lights are on a first-come, first-served basis. 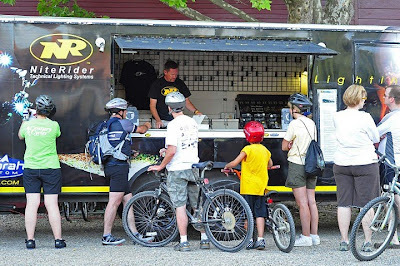 The complete line of NiteRider bicycle lighting systems will be on display in NiteRider’s rolling showroom that goes to bicycling events around the country, including the Sea Otter Classic and 24 Hours of Moab. In addition to the product demo, a NiteRider representative will be on hand to answer questions, distribute catalogs and give away a NiteRider MiNewt Mini-USB bicycle light (MSRP: $100) by random drawing to one lucky Century Cycles Night Ride participant. For more information, go to www.centurycycles.com/goto/nightrides or call Century Cycles in Peninsula at 330-657-2209. Now in their 15th year, Century Cycles Night Rides on the Towpath Trail are FREE group bicycle rides at night along one of the area’s most popular bike paths – the Towpath Trail in the Cuyahoga Valley National Park. They attract hundreds of bicyclists who enjoy it as a fun family outing, a unique date night, or a just a casual bicycle ride with friends by moonlight. Century Cycles Night Rides on the Towpath Trail are open to riders of all ages and abilities, with no pre-registration necessary. Each casual, moderately-paced ride starts promptly at 8 p.m. in the parking lot of the Century Cycles in Peninsula and is approximately 12-15 miles long (about two hours). Parking is available at the Lock 29 Trailhead, just north of the store. Helmets, bike lights and a bicycle are required. Children 15 years old and younger must be accompanied by an adult. Although no registration is required and they are free, a waiver must be signed.